Just finished a marathon? Just woke up after a bachelor party? Training to challenge Takeru Kobayashi in a hot dog eating contest? 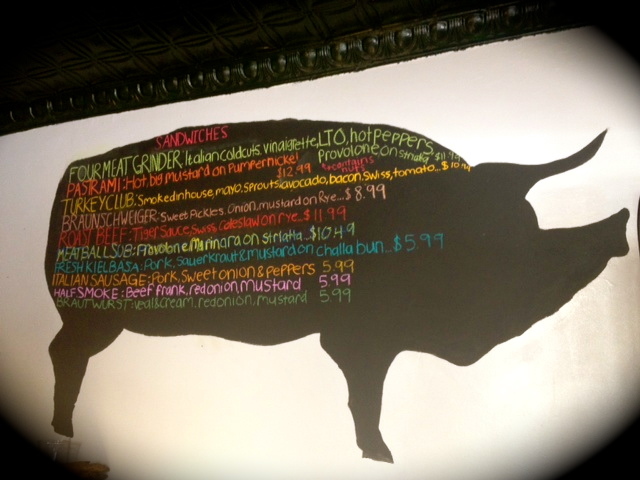 We have the perfect meal for you: The Best Thing on the Menu at Stachowski Market in Georgetown. Roll up your sleeves, bring some friends and try the Pastrami Sandwich: Thick slices of pastrami on pumpernickel w/mustard on rye. Taken to go, and all wrapped up, this sandwich has the girth of a regulation NFL football. They even slip in some extra bread, knowing full well that you’ll be making sandwiches for days. Check out our leftovers?! 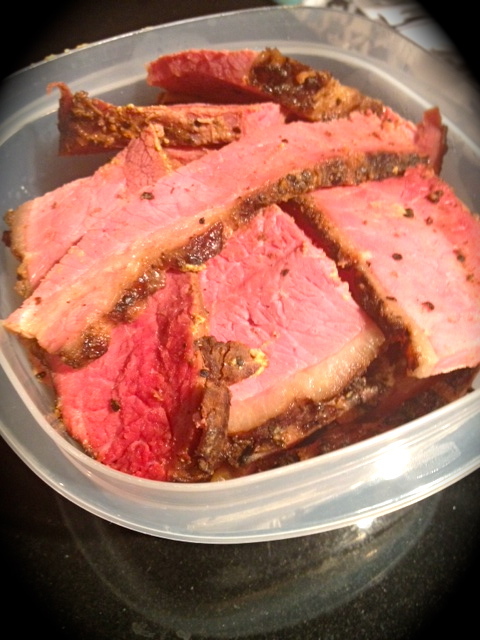 The pastrami is smoky and salty and definitely needs to be paired with mustard. We heard it had been boiled over night and it’s served hotter than well, the Redskins season. Other tasty sandwishes (sandwiches you wish you were eating while you read this) include the 4 Meat Grinder, Turkey Club and Kielbasa. This charming shop has some of the warmest service we’ve experienced in a while, and you can tell that they take pride in serving their products. In addition to their 11 sandwiches they also have a charcuterie collection worth ogling, as well as meat ready to take home and cook including some exotics like venison T-bones. It’s an understatement to say that Jamie Stachowski is a master of meat. Busy downtowners that don’t have time to cook dinner after a long day lobbying or setting things straight in Congress, can swing by Stachowski’s on their way home from work to pick up prepared meals to take home and enjoy. Recent meals have included Spaghetti Bolognaise: Smoky beef simmered with a merlot red wine sauce served with Caesar salad and Mojo Kabobs: Grilled, marinated chicken served over a bed of seasoned rice. Georgetown too far to schlep to Stachowski’s? You can pick up their products at area farmer’s markets. 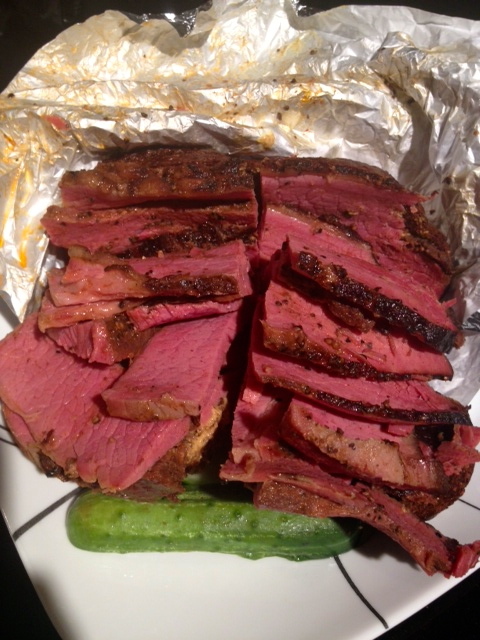 Pastrami Sandwich not your BTM? Post your favorites in the comments section. This entry was posted in Restaurants and tagged Best Sandwich, Charcuterie, Club Sandwich, Deli, Farmer's Market, Georgetown, Grinders, Jamie Stachlowski, Leftovers, Pastrami, Pastrami Sandwich, Prepared Meals, Sandwich Shop, Stachowski's Market, Venison. Bookmark the permalink.